President Trump sought to school Democrats in the “Art of the Deal” Saturday with a proposal to reopen the federal government—by offering protection for 1 million immigrants in exchange for a $5.7 billion border wall. But 29 days into the longest government shutdown in history, Dems rejected Trump’s plan before he even uttered it. During a 15-minute speech from the White House, Trump said he would protect about 700,000 immigrants known as “Dreamers” for another three years. That group came to the US as kids and has proved to be a flashpoint in the debate on immigration. Trump also offered a three-year extension for another 300,000 immigrants living in the US under Temporary Protected Status, or TPS, which is granted to victims of natural disasters and political turmoil in their home countries. “I’m here today to break the logjam and provide Congress with a path forward to end the government shutdown and solve the crisis on the southern border,” Trump said. He repeated his call for $5.7 billion to build the wall, his main point of contention with congressional Dems who have rejected the request to date. $563 million for the immigration court system, including 75 new judge teams. Senate Majority Leader Mitch McConnell (R-Ky.) said he will bring the proposed legislation to the floor for a vote this week—potentially putting moderate Senate Democrats in a difficult position. “Unlike the bills that have come from the House over the past few weeks, this proposal could actually resolve this impasse” and “quickly reopen the government,” McConnell said in a statement. Trump’s proposal reportedly grew out of talks with the senator. McConnell had argued the offer would put pressure on House Minority Leader Nancy Pelosi (D-Calif.) after weeks in which she refused to consider wall funding. Pelosi was quick to reject the offer. “It is unlikely that any one of these provisions alone would pass the House, and taken together, they are a non-starter,” she said in a statement her office released as details of the plan leaked—and before Trump went on TV. While Pelosi called for several items that are part of Trump’s plan—including technology upgrades to screen for drugs, weapons and other contraband and more immigration judges—she did not offer a clear alternative to the president’s proposed deal. She insisted that Trump allow the government to reopen before any discussions on border protection proceed. Observers said automatic rejection is the wrong move for Dems. Jeanne Zaino, a politcal analyst and professor at Iona College said while polls show the president’s approval rating has dropped since the shutdown began, public opinion could change quickly if Democrats refuse to negotiate. “They are going to find themselves looking like they are unwilling to compromise,” she said. House Democrats are not going to give Trump a dime for the wall he wants to build, steel slats and all, they also aren't going to give him the chance to be the hero with a DACA deal. The only positive I see so far from any of this is the rise in support from the Hispanic and Latino American communities for Trump and border security. So nice to see this showing up in polls. Hispanic Americans are the first front-line victims of illegal immigration into the US, especially those who live along or near the border with Mexico, with black Americans the second front-line victims who experience the job loss and wage deflation caused by illegal aliens in our work force. Build the wall...We have millions of tires piled up in junkyards. Dig a trench, stack them 3 wide and 10 deep, fill them in with cement. Build the wall on top. This cleans up our junkyards and recycles the tires. Prevents them from tunneling under it too. Let our military dig the trenches, they have bulldozers, we already pay their paychecks and paid for the equipment! Get the tires in and get it done in preparation for the wall. Trump is sending our military to the border...send the bulldozers too. Let the military Reservists do their annual 2 week duty on the border to dig the trenches. Volunteers will deliver them in semi trucks for the cost of gas. Cleans up our cities! Last edited by Beezer; 01-20-2019 at 04:32 PM. Trump also wants to legalize ALL the illegals in this country. He screwed us big time. Trump signals support for pathway to citizenship for 11 million undocumented immigrants living in the U.S.
During a meeting Tuesday with Democrats and Republicans, President Trump indicated his willingness to get behind an immigration deal that could serve as a pathway to citizenship for millions of undocumented immigrants, The New York Times reports, adding that "such action has the potential to alienate the hard-line immigration activists who powered his political rise and helped him win the presidency, many of whom have described it as amnesty for lawbreakers." The talk came ahead of a looming government shutdown, with Democrats unbudging on the budget unless the 800,000 "DREAMers" brought to the United States illegally as children are protected from deportation. Trump signaled that beyond a DREAMers deal, he is also interested in a solution for the 11 million undocumented immigrants living in the United States already. 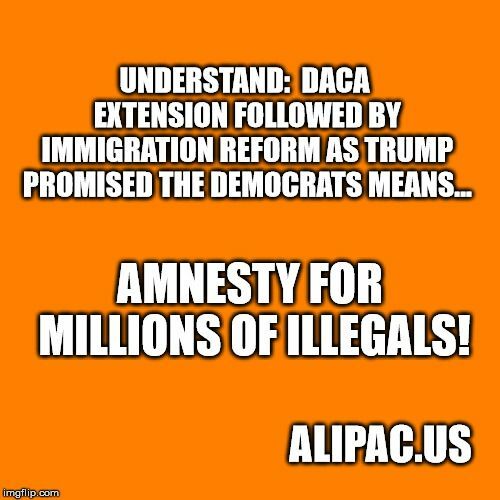 Trump should now say that he tried to negotiate with the democrats, and go ahead and use his emergency presidential powers to bypass congress and build the wall, while also, under the same umbrella, add the additional 15,000 ICE agents, more border patrol agents, and more judges to try these cases for deportation. He needs to do this now. And making E-Verify mandatory, along with way stiffer penalties for people who employ them, would also be helpful. stoptheinvaders, Beezer, Judy and 1 others like this. "such action has the potential to alienate the hard-line immigration activists who powered his political rise and helped him win the presidency, many of whom have described it as amnesty for lawbreakers." One of our problems is the way we have allowed the left to own the language. Why is it hard-line to want immigration laws enforced? Why is it hard-line to not approve and cheer on this invasion of our country we are seeing now? Why is it hard-line to not want to pay the hospital bill for a baby born in 24 hours after his invading Mother climbs a fence? MW, Beezer and 6 Million Dollar Man like this.